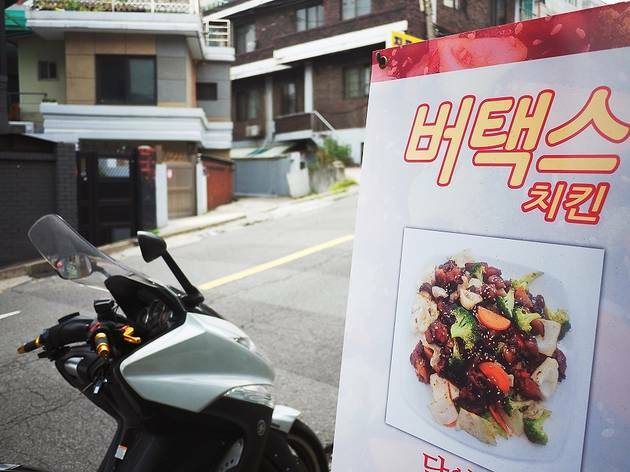 When you hear that an amazing new teriyaki chicken place has just opened, you go expecting something more than… a smoky kitchen with a few plastic tables on a side street in Haebangchon. It’s not very aesthetically pleasing. You can’t blame them though because they’re mostly a delivery and pick-up service that caters to businessmen and large companies. It wasn’t until recently that their delicious taste started to make its way to major social networks. Steven Kim’s really confident (borderline cocky) about the food. In their first month, they guaranteed that if you liked their Facebook page, you could get a dish for free. The menu’s simple, it’s chicken or shrimp available in two sizes with either the pepper sauce or the teriyaki sauce and a side of slightly stir-fried vegetables. “Free? Are you sure?” I ask, feeling bad but Steven’s firm response of: “Try it once and I’m sure you’ll be back.” Defiantly, I take a bite… and it is the most delicious teriyaki chicken I’ve ever had in Seoul. The meat (the chicken’s surprisingly Halal) is cooked first with a slight char around the edges giving it an accent of smokiness and then the savory Teriyaki or pepper (a spiced up Teriyaki) sauce is poured on afterwards. Steven’s particular recipe avoids the two pitfalls that make for poor Teriyaki—tough meat and greasiness. Both the chicken and the shrimp are tender and juicy. Also, who knew that Teriyaki sauce could somehow feel light without sacrificing the taste? 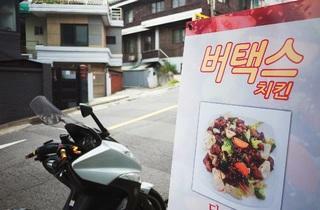 It’s free delivery to anything located in Haebongchon, Itaewon or Gyeongridan, but feel free to go for a sit-down meal. The permitted attire’s not actually “dressy,” as their Facebook page would suggest, but Steven’s not joking about one thing—the food will definitely have you coming back for more.